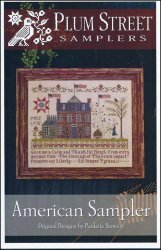 American Sampler [H5081] - $14.00 : Yarn Tree, Your wholesale source for cross stitch supplies. Cross stitch pattern from Plum Street Samplers. Inspired by the great state of Virginia. A stately home decorated for July 4th with three flags. A colonial man and lady are holding a branch from the Flowering Dogwood. A cardinal is perched at the top of the tree. At the bottom is a verse "Give me a Calm and Thankful Heart. From ev'ry murmur free. The blessing of Thy Grace impart. Preserve our Liberty...Sic Semper Tyrannis". The states motto Sic Semper Tyrannis ("Thus always to tyrants") is featured in the verse . Stitch count 227w x 189h.